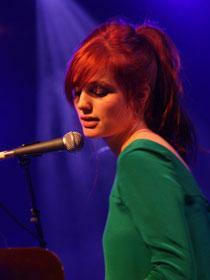 A Fine Frenzy is actually just a fine young singer-songwriter from Seattle, born Alison Sudol. A self-taught piano player, on her debut album she pairs sweeping orchestral arrangements with dreamlike lyrics inspired by the classic works of fantasy writers like CS Lewis, EB White, and Lewis Carroll. Add to that a propensity for frilly shirts and cryptic song titles such as "The Minnow & the Trout" and you half-expect to find a back alley Joanna Newsom. Instead Sudol specializes in accessible pop epics, the kind of songs that fit perfectly over the end credits of a great Hollywood tearjerker. Despite the gentle melancholia that runs through "Ashes and Wine" and "You Picked Me," each tune arrives wrapped in an exuberant melody and topped by the singer's commanding voice. On the disc's standout moment, "Almost Lover," she shows she can do simplicity as well, musing over a sublime piano medley, "Shoulda known you'd bring me heartache/ Oh, most lovers always do."